Goto https://bnet.marlam.in/ and register there. This site provides you with everything you need. Goto http://myip.is/ and note down your IP. Go back to https://bnet.marlam.in/ and hit Settings in the top right corner. Enter your IP address in the Settings. Make sure you scroll down to the bottom of the page and hit SAVE! Close your Battle.net launcher if its running! Goto the place where your Battle.net launcher has installed your Warcraft and rename the Folder. Don't start your Battle.net Launcher YET! Start your Battle.net launcher and you will see that you can now install World of warcraft. Normally install WoW as if you want to play on live server. Don't mind the Launchers look it will download the correct version. If you get any errors during this step simply restart your Battle.net launcher and download. Q: How do I get my Battle.net launcher to work normal again? Q: How do I check if my versions correct? 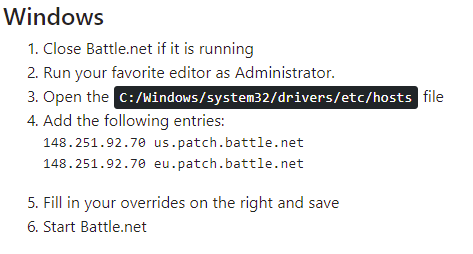 A: Goto the place your Battle.net launcher is downloading to and right click your exe once it has shown up. Under the Details Tab it shows you the game Version. https://bnet.marlam.in/overrides.php - The Owner of this site who ever he may be! Luzifix - Thanks for showing me how it works! I am Thor! Supreme commander of the Asgard Fleet! I have done all the steps (window 10) but BNET always download the version 7.3. Sorry for the delay, i was out of home. Yes, i do all of that on my PC and other PC's (with window 10). Not working, all the time it tries to download official version. It's really weird, i repeat the process a lot of times. Bnet close. IPV4 saved. Version add to the override. IP on Host. Nothing, same problem. ¿Meaby it's a problem with OS o bnet version?. PD: I see version in the wow.exe when appears on directory. I can confirm, that it's not working at the moment. They deactivated the service due to high amount of traffic. Sadly this method is no longer available. Ill try to provide a downlaod link over the next days. just curious any idea how the process goes? I am Glenard Rifler of Ironforge lead by the leaders of the Wildhammer Clan.